QimiQ is a completely new natural dairy base that can be used for cooking and baking all kinds of food, both hot and cold. It can be used instead of eggs, butter, gelatin or cream and contains only 15% fat. The product was invented by Hans Mandl and Rudolf Haindl in 1995, and was designed to replace artificial emulsifiers and stabilizers by blending with liquids such as alcohol or vinegar; it also emulsifies with oil. In QimiQ, gelatine is already included, so for certain recipes, there is no need to soak gelatine sheets in liquid and then add them. 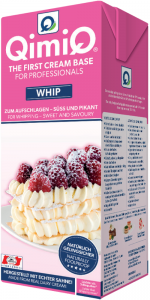 QimiQ cannot be over-whipped like conventional whipping cream. it is stable when exposed to heat or mixed with acids or alcohol, and thus can be used in food products where milk products cannot be used. What can you make with QimiQ? 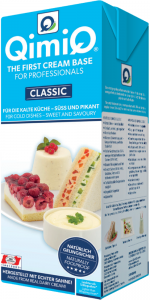 QimiQ is ideal for sweet and savoury, hot and cold dishes such as creams, mousse, cake fillings, spreads, dips, mayonnaise, soups, sauces and much more.